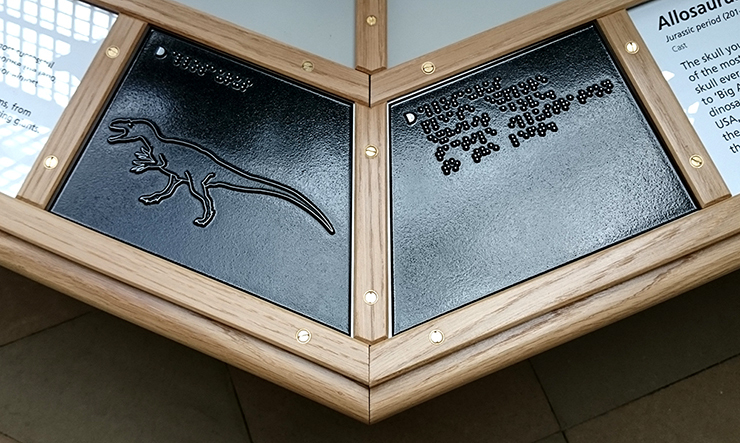 Claire Venables of Giraffe Corner was commissioned to design and create two new stands for the OUMNH, under the tile of Sensing Evolution. 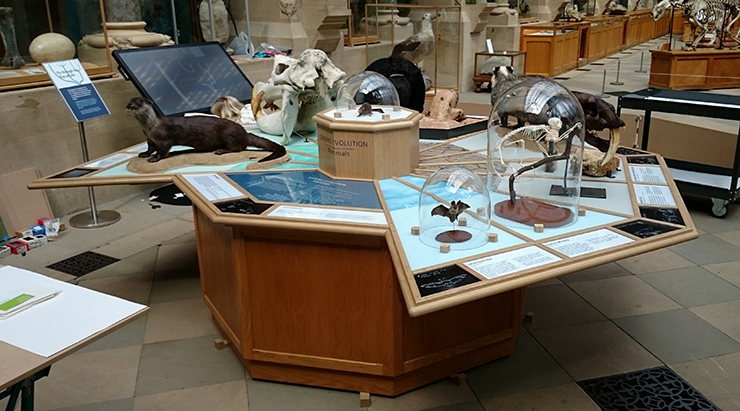 One stand was to feature Reptiles and Birds, the other was to feature Mammals; each to be divided into three environmental zones: water, land and the air. 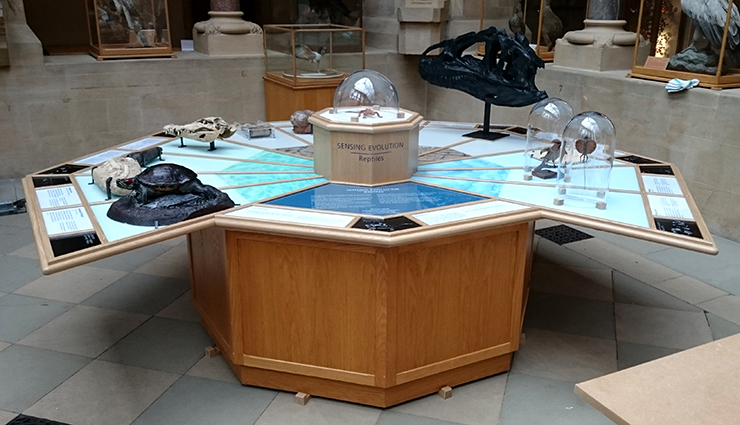 Both stands were to display a combination of purely visual exhibits and those that can be handled by the visitors. Where an animal was to be represented by an exhibit that cannot be handled or by a partial exhibit, that organism was to be depicted by a tactile line drawing. Alastair Somerville of Acuity Design and I were bought into the project to design and manufacture the tactile illustrations and Braille labels. Our first task was to develop an approach that made the best use of the limited space and unusual shape of each panel, was the most effective common way of depicting all of the animals and which resulted in a simple and elegant series of depictions. 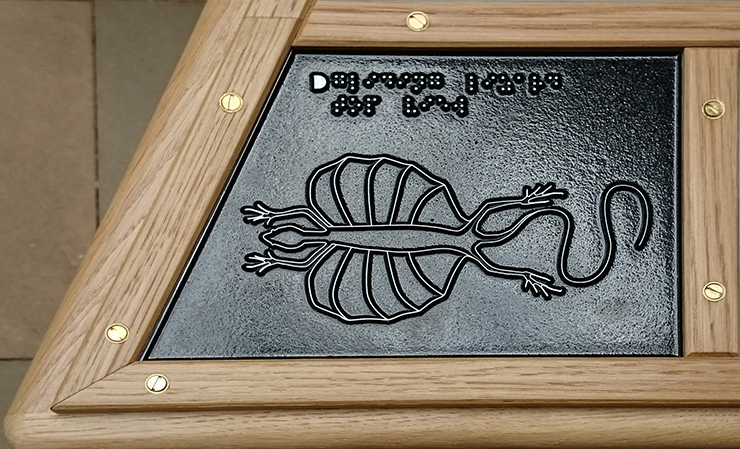 Viewed from above, you can clearly see the relative size and shape of our panels (in black); in the image of the Reptile Stand, below. Where it is necessary to represent objects as two dimensional tactile forms, our usual preference is for tactile silhouettes, which depict their subjects with solid raised areas. These actually have closer conceptual relationships to their subjects, than do tactile line drawings and are appropriate when the essence of an object can be communicated in such a manner. However Alastair and I felt that such an approach would not do justice to all of the animals, that we were to illustrate here. For instance, the structure of the Long Eared Bat's wing and the detail of the Gliding Lizard each required more detail than a silhouette could clearly convey. As consistency is essential for clarity, we decided that each animal was to be represented by a simple tactile line drawing. While there are limitations in this approach, we did not expect such work to stand on its own in isolation but rather to augment a wider experience; which would include conversation and Braille labels. That said, tactile line drawings are more easily interpreted by the vast majority of blind and visually impaired people who have visual memory. Clarity, accuracy, consistency, simplicity and elegance are all virtues to be aimed for. However there is usually a tension between them and some degree of compromise is required, to ensure that one of these virtues is not sacrificed altogether for the sake of the others. 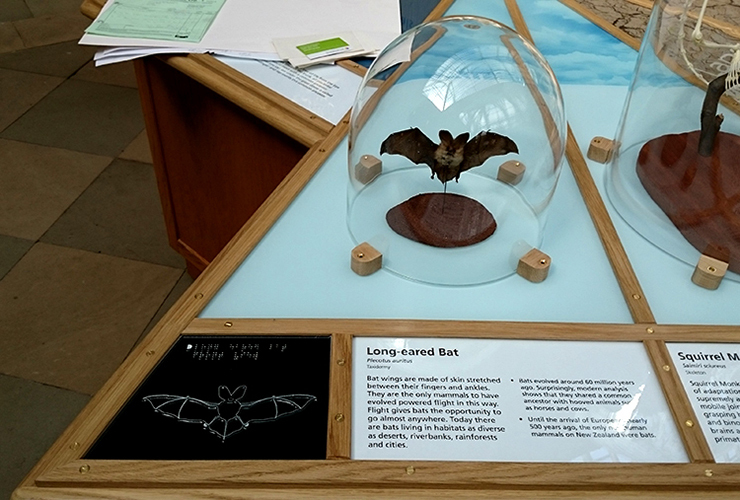 Long Eared Bat in context. By default, each animal would be depicted in profile, with the head at the left hand side. 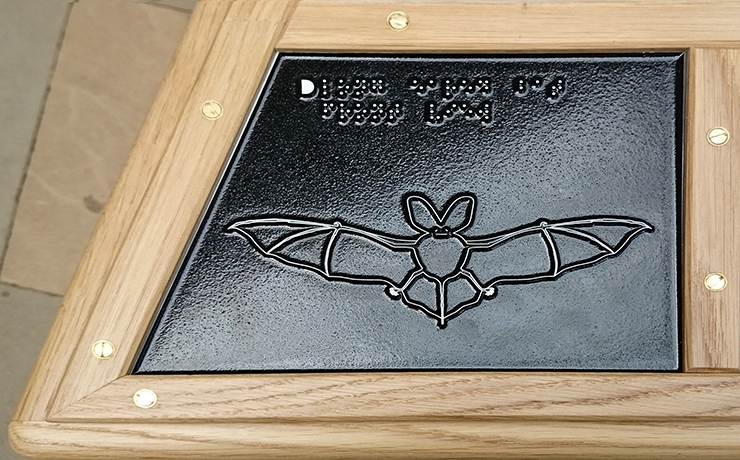 Where clarity demands that another view is shown (such as the Long Eared Bat, above and below); this was to be indicated in Braille, just under the title. We decided that the final work would be manufactured in metal, as this offers a life expectancy of over 25 years. Once these decisions were made I set about creating the artwork. As I was working to a very tight deadline, I decided to seek the relevant permissions to base some of the tactile drawings on existing illustrations. The originators or owners of these images are credited below: I have also included their websites in the links page, in this site. Other tactile drawings were created from scratch, with the aid of multiple reference images. In either case, the challenge of this work was to reduce the essence of each animal into the simplest possible line drawing; whilst ensuring that they were pleasant to both touch and view. Once the work was completed, swell print versions were then created; which were used by Alastair Somerville to test the work, with blind and visually impaired people. They were then sent to manufacture after final approval had been given by Claire Venables of Giraffe Corner and Rachel Parle, an OUMNH staff member. A metal tactile line drawing of a Long Eared Bat. The Long Eared Bat was based on a well known line drawing by the remarkable 19th Century German naturalist and illustrator, Ernst Haeckel. The great man's work is now in the public domain and his drawing of this creature remains the most clear and detailed orthographic representation of the animal I have seen. 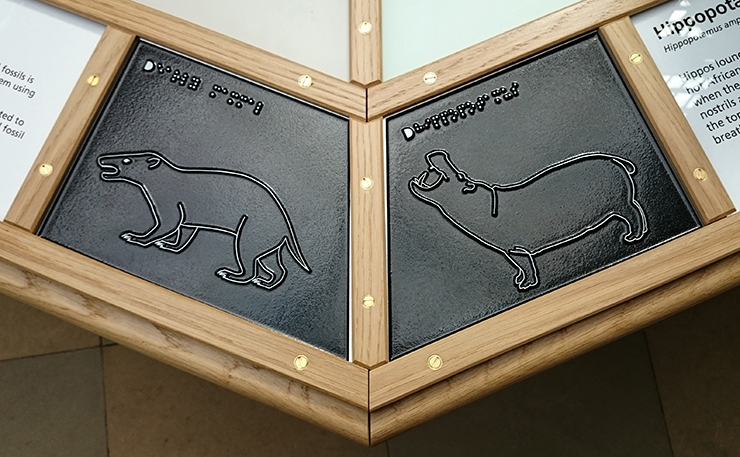 Metal tactile line drawings of an early Mammal and a Hippopotamus. Both these drawings were made with reference to a wide number of images. My first attempt at the Hippopotamus showed it with his head forward and its mouth closed. As requested, I replaced its head with the current one. I was surprised to discover the wide variety of body shapes and proportions that exist among various individual Hippopotami. 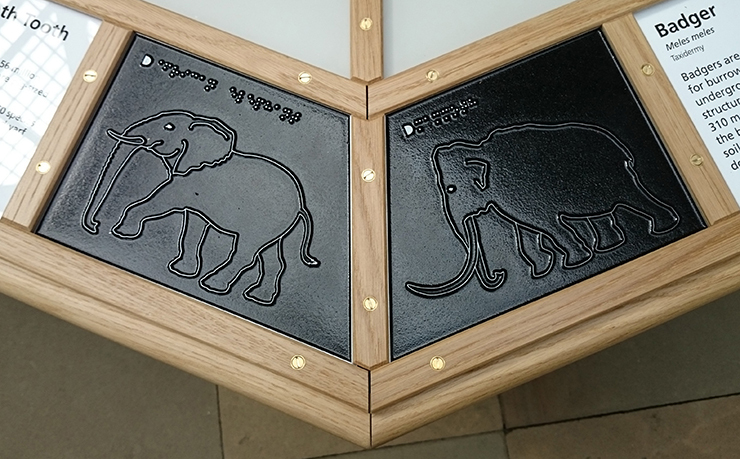 Metal tactile line drawings of an Elephant and a Mammoth. I was given kind permission, by London's Natural History Museum, to base my drawing of a Mammoth on one of their images. I then needed to create an Elephant that complemented it well. I started off with a purchased stock image - the only suitable orthographic reference image I could find - and then modified it quite heavily, so that its posture and trunk were comparable with its extinct cousin. 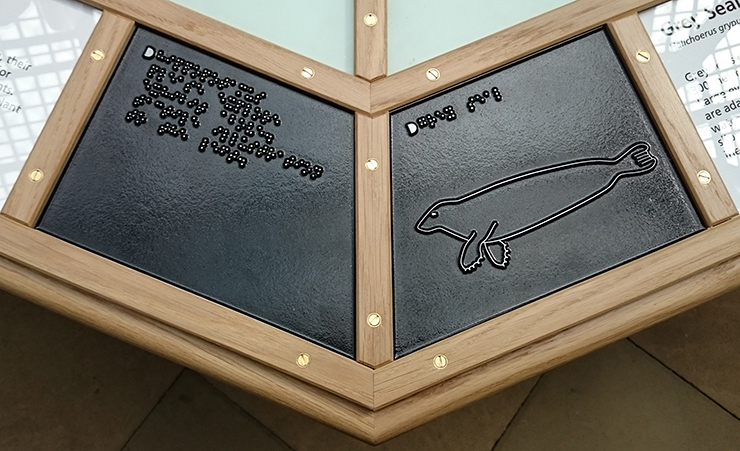 A metal tactile line drawing of a Grey Seal. I initially based my Grey Seal on a lovely watercolour, by wildlife illustrator Lizzie Harper. The painting showed a hauled out Grey Seal but it was subsequently decided that the line drawing should look like the animal could be swimming. Consequently the final drawing bears little resemblance to Lizzie's work: however I would like to thank her for allowing me to use it as a reference and a strong starting point. 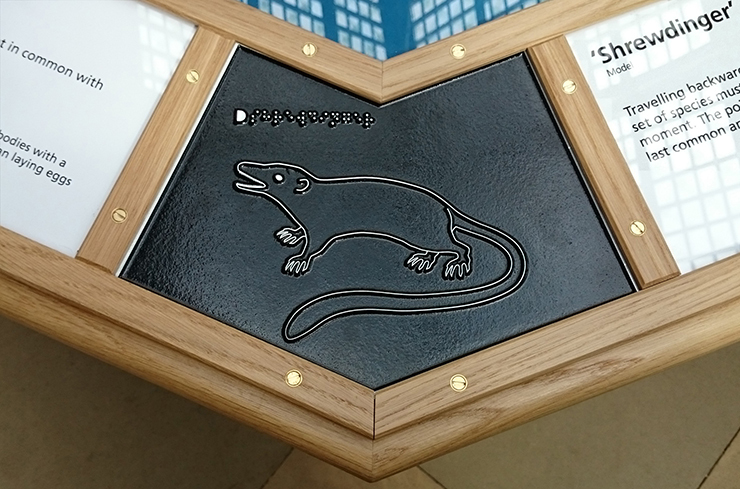 A metal tactile line drawing of a Shrewdinger. I could find only one suitable source image for the Shrewdinger; the hypothetical, earliest common ancestor for all living Mammals. This was a wonderful illustration by Carl Buell. Use a search engine and you will get a wealth of amazing images but very little written information about him: this highly regarded illustrator of prehistoric animals is currently taking a sojourn from the internet. In spite of not being able to contact him I would like to express my gratitude for his remarkable work (I would love to see a fat coffee table book, of his images). The elegance and simplicity of his depiction, meant that this was the easiest of these drawings to undertake. I am also grateful to the American Museum of Natural History (AMNH), the copyright holders; for their permission to use the work, as a basis for this tactile line drawing. 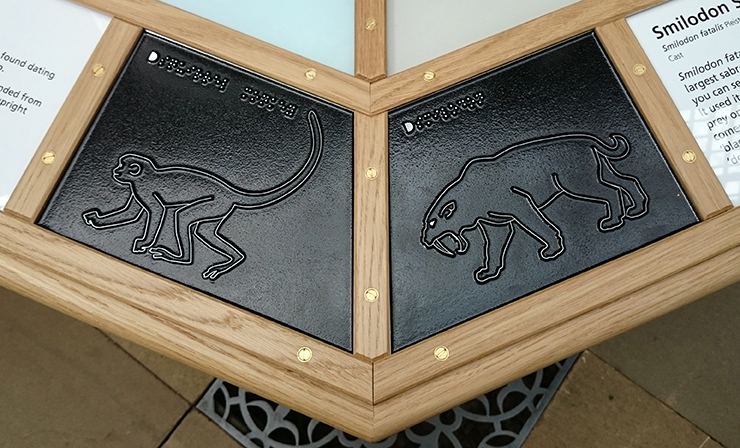 Metal tactile line drawings of a Squirrel Monkey and a Smilodon. The Squirrel Monkey was the most difficult of these drawings, as I simply could not find any suitable profile images of this lively creature. I visited Cannon Hill Nature Centre in Birmingham and took loads of pictures of them. Due to the lag on the phonecam, I did not manage to take the definitive profile: the little critters never keep still. Consequently my effort was made from scratch; from both memory and reference to the best five or six images, out of the scores I had gathered together. The Smilodon was based on a painted illustration of a Smilodon fatalis, courtesy of the Indiana State Museum and Historic Sites. I would particularly like to thank Kara Vetter, of the ISMH&S, for appraising my work and giving it the thumbs up. A metal tactile line drawing of an Allosaurus. Scott Hartman is a renowned paleontological illustrator whose website is called skeletaldrawing.com (see my Links page). Scott very kindly let me use his work as a basis for some of these tactile drawings. This tactile drawing of an Allosaurus is based on of one of Scott's excellent skeletal drawings. A metal tactile line drawing of a Concestor. This drawing of a Concestor - the most recent common ancestor of all Reptiles, Dinosaurs and Birds - was based on the OUMNH's own model of this hypothetical creature. The photographs I was given, showed the model at a slight angle. While I was able to copy the limbs from this material; I had to create the head and body afresh, using images of several species of living Reptiles as visual references. A metal tactile line drawing of an Edmontosaurus. This drawing of an Edmontosaurus was also based on Scott Hardman's skeletal drawing of the same. A metal tactile line drawing of a Gliding Lizard. None of the initial reference images, that I used for for the Gliding Lizard, clearly showed how its ribs splayed out to form the creature's lateral sails. For that reason, the first version of this drawing lacked this detail. 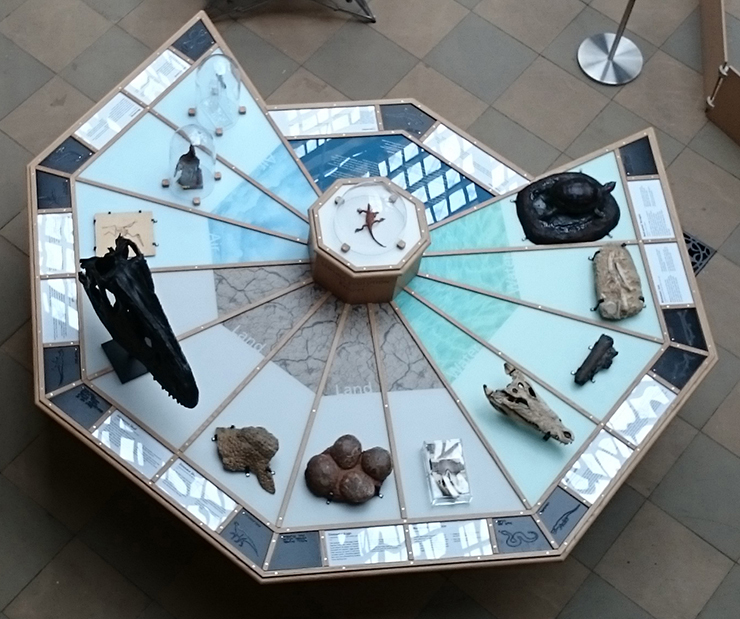 Having since seen the specimen, at the Museum, it is clear why the OUMNH staff requested me to add this element to the work. It is critical to the understanding of this animal; even though it results in a slightly more complicated drawing, than would otherwise be desired. 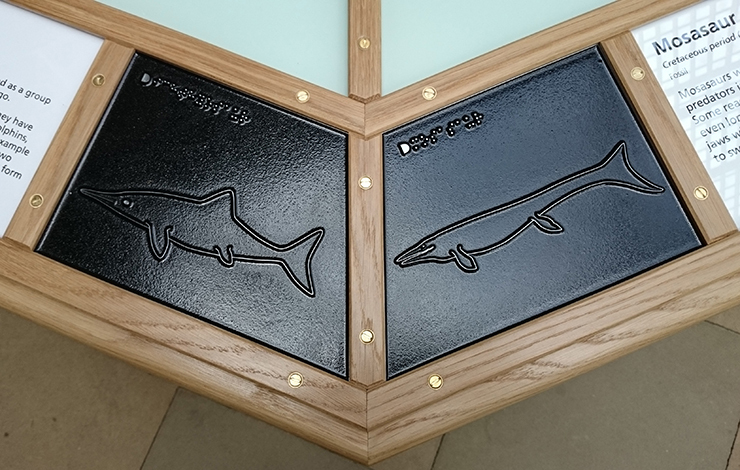 Metal tactile line drawings of an Ichthyosaur and a Mosasaur. Throughout the project we had decided that the various animals to be depicted would be named by genus rather, than species. In most instances each genus would be represented by its most well known representative. However in the cases of both the Ichthyosaur and the Mosasaur; it was decided that the drawings should be as generic as possible, to each genera. In the case of the Ichthyosaur, I referenced both images sent to me by OUMNH and those in my personal library. The result is a kind of common denominator of all the species I studied illustrations of. The Mosasaur was a bit more tricky. When I was a child these animals were depicted rather like Crocodilians, with paddles instead of legs. Current thinking is that they were more adapted to marine life and had the tail flukes, that I have shown. However my first attempts apparently still looked too lizard like. With the guidance and advice of Philip Hadland, from the OUMNH, I gave the animal the thicker tail and more barrel like body, you see here in the final version. 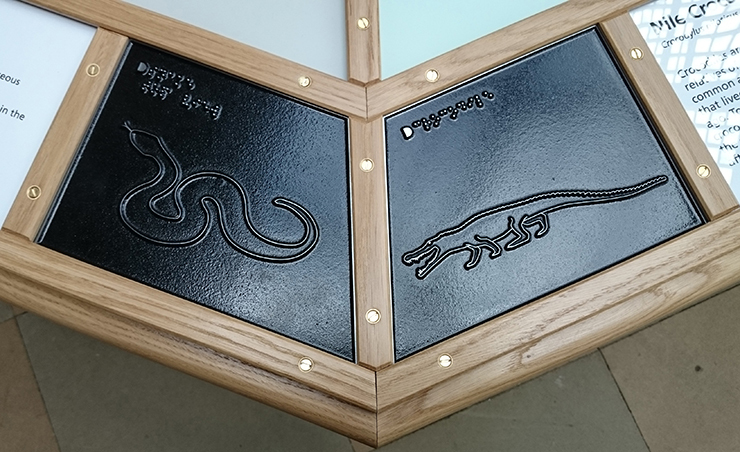 Metal tactile line drawings of a Snake and a Crocodile. The Crocodile and the Snake were completed late one night, very close to the deadline and unfortunately I have lost my notes about these two drawings. I cannot remember the species of Snake I chose to depict but I decided that a short fat one would be best for both clarity and aesthetics. The Crocodile turned out to be surprisingly difficult: I could find images of them either in profile, resting on their bellies or standing up, at an inconvenient angle. As I had decided that the animal needed to be shown in profile and standing up, I recall hours and hours researching not just crocodiles but also illustrations of their relations (including extinct Crocodylomorphs). What I think I produced in the end was a kind of generic Crocodilian; that at this level of detail, served perfectly well as a Crocodile. 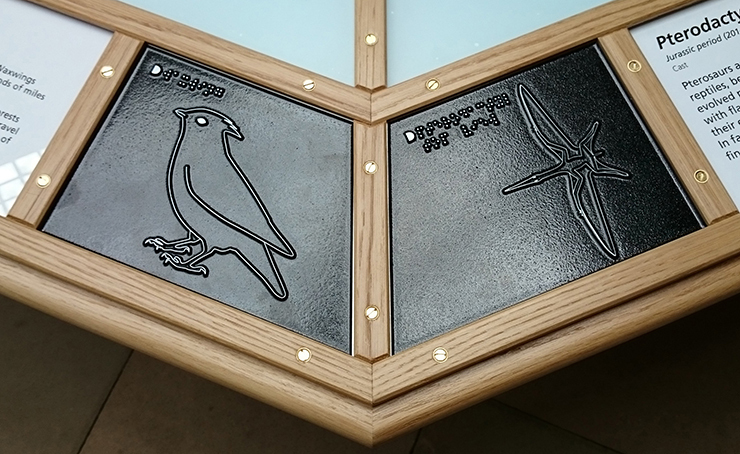 Metal tactile line drawings of a Waxwing and a Pterodactyl. I could not find any satisfactory images of Waxwings in profile so this drawing was made up from bits of other Passeriformes (song birds), which I then modified with a crest. The OUMNH staff then requested me to make the crest a bit more "cresty", which I did. The Pterodactyl is closely based on John Conway's illustration of a Pterodactylus kochi; which he kindly allowed me to use, for this project. Although the drawing does not sit easily in the available space; any other view of this animal would not covey its essence as well as a view of it, from above, whilst in flight. 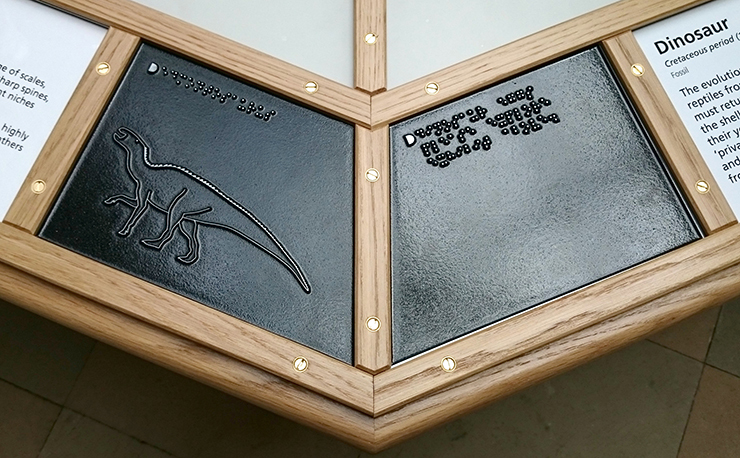 For reasons of consistency and clarity, it was important the Pterodactyl faced to the left. 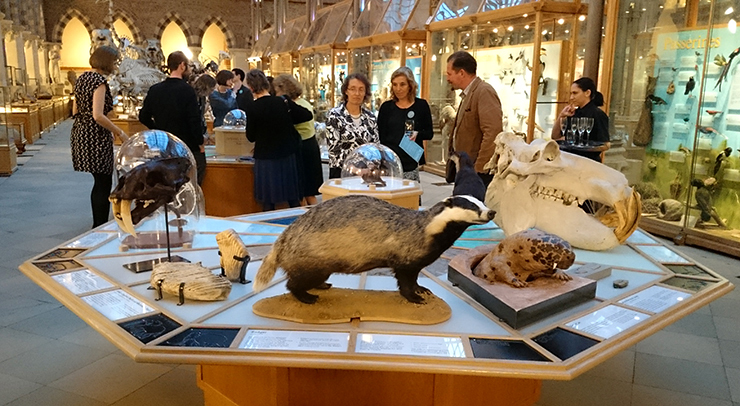 As one of the creators of the Sensing Evolution exhibitions, I was invited to the official opening on the evening of 7th May 2015. It was also the opening of another fascinating exhibition, called Biosense, which explores the fundamental bio-mechanics of life. Both are well worth seeing, if you can. I was immediately impressed by both Claire Venable's impressive design and the high standard of manufacture by carbon:colour and the in house OUMNH staff. I was also delighted to see my work in place and in context. It was very noticeable was that fully sighted people also really enjoy touching the tactile drawings. Both Claire Venables of Giraffe Corner and Rachel Parle of the OMNH were a delight to work with: I am grateful to them for providing clear and unambiguous direction, at all times. My thanks too to Alastair Somerville of Acuity Design. His input was critical for both developing our approach to this challenge and also for testing the work. The most attractive design is useless if it is not effective in its primary function. I have already thanked the artists and organisations, who have allowed me to use their illustrations as a basis for my tactile line drawings. Without their help it would have been very difficult to complete the project on time. If you have time, check them out through my Links page.